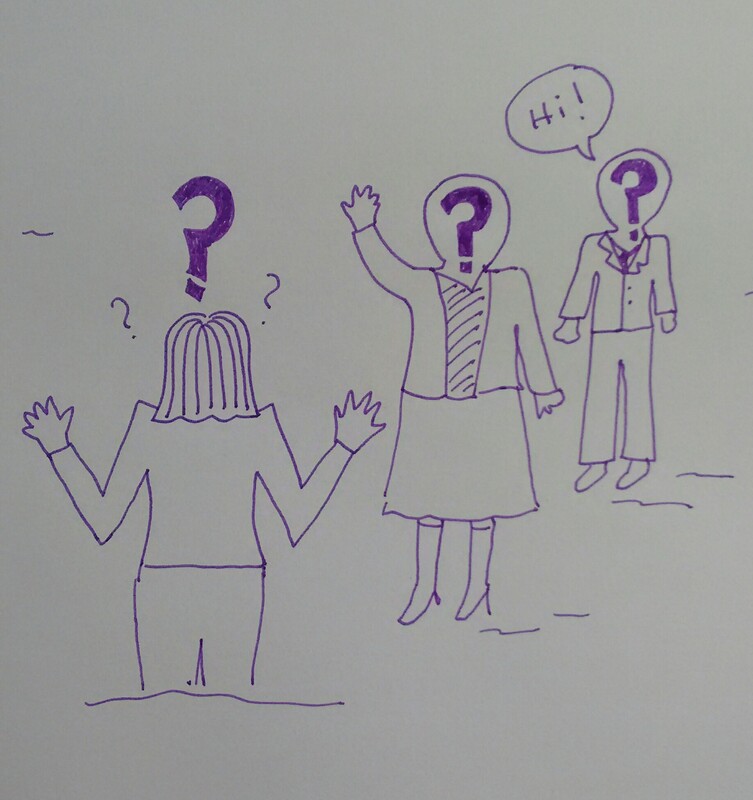 What is prosopagnosia and how does it affect the self-employed person? I read an interesting article in the Guardian newspaper this week about prosopagnosia (or “face blindness”).This is a condition I suffer from (not in the most severe way, but it does affect my life – and my business life), and I haven’t found much else about prosopagnosia and the businessperson. So, I thought it might be useful to share some information about what it is, how it affects me, as an example, and some coping strategies I’ve worked out for it. I would love other prosopagnosics to share their experiences and solutions, too, and I have added links to some useful resources at the end. I know this is a long piece, but I didn’t want to be all teaser-ish and leave the coping strategies to another blog post. Feel free to jump down to those, though, if you want to! Prosopagnosia is also known as face-blindness, and this key term really explains what it is. Someone with the condition can see another person’s face OK: they can usually identify it as a face. What they can’t do is recognise who it is, tell the difference between similar-looking people, recognise familiar people in a different context, etc. In severe cases, people can even be unable to recognise their own family members, in whatever context, apart from knowing “If it’s a man in my house, it’s likely to be my husband”. Many prosopagnosics have complicated workarounds to help them to recognise people – their gait, glasses, common items of clothing – but this isn’t always fail-safe. A side-effect of this can be an inability to distinguish expressions and emotions on people’s faces. Where does it come from? You can pick up prosopagnosia from a brain injury or stroke, but most people acquire it as what the experts call a ‘developmental disorder’, i.e. it’s a connection that doesn’t get made at the right time when your brain is developing in early childhood. It can be really distressing to be like this. I’m a reasonably friendly and warm person who likes to help other people. I have a horror of offending people or being rude. How horrendous to find out that you’ve repeatedly blanked someone in the street or to ask someone what they do, only to see a shocked expression and realise that they told you all about their business last time you met. There’s lots of information and the scientific stuff on a handy University of Bournemouth website. I didn’t know I was prosopagnosic for years – but I discovered the term in my 30s and breathed a HUGE sigh of relief. It was “A Thing”. I wasn’t just weird (well, not in that way, anyway). Other people had it! I don’t have the most severe form of the condition. I can usually recognise family members and close friends. But it’s not like that thing where you know you know someone but can’t remember their name. I will see someone I spoke to last week – yesterday, even – and if they’ve not “taken” in my mind, I will not have any idea that I’ve ever met them before. Until they walk up to me, know my name, and know things about me, that is. So, I have trouble recognising people or knowing that I’ve ever seen them before. I will walk past people I know quite well. I have developed coping strategies – I joke that I got together with my husband because he had a distinctive hairline (he had a widow’s peak, not some weird curlicue business) and a goatee and has a distinctive gait. This is only partly true. But I do get very discombobulated when he changes his beard, and I am well-known among my friends at parkrun for having real trouble picking him out in a crowd of runners – even if he has his special hat on. I’m also not good when watching new TV programmes with lots of people (Strictly Come Dancing can be difficult in the early weeks), such as soaps and reality shows. This sounds funny, but it can REALLY annoy the person you’re watching with. I am known for mixing up pairs of people who I genuinely think are the same person (Matthew Broderick and John Cusack for example). They may not look identical to you, but if they have similar coloured hair and body shape, they’re the same person to me. I don’t THINK I pick friends based on them having very definite looks or features, but I wouldn’t put it past me. I know I recognised one friend from her shoes rather than her face or hair when I saw her on the high street once (phew, got away with it). Changes in context. Give me someone from running club in running kit on club night or, within reason, in normal clothes and a similar hairstyle, volunteering at parkrun and I’m fine. Present them to me on the high street, in town, on a train, at the airport – not so much. I met someone in the gym the other day who recognised me from one meeting, when I scanned her barcode at parkrun a few weeks before. She knew she knew me from somewhere – not something that I’d manage to achieve! Changes in look. I am constantly amazed that someone I know from said running club can recognise me not in flourescent gear and with my hair down rather than in bunches. To me, that’s a different person, someone I don’t know. How do they do that? I’ve actually reached a point where I just explain it to new people I meet who I might meet again. I didn’t do this when I started networking for business, and I really wish I had. I certainly remember asking a “new woman I’d never met before” her name and being horrified to realise I’d met her twice before, and had quite long conversations with her. I wish I’d explained my condition then, and I will be sharing this post with her! The good news: I do eventually get used to people and recognise them pretty well immediately – but it takes more meetings than it will for the average person. I’m also quite good at telling identical twins apart, maybe because I’m used to doing the checking of extra details that non-prosopagnosics don’t have to worry about. Business revolves around recognising people. Even if you craftily have a job where you don’t have to deal with your clients face to face (hello, editing and transcription! ), you tend to end up doing events, going to networking, etc. All of that can be a minefield. It’s all about who you know, and meeting, liking and trusting people – difficult if the person you’re speaking to seems to think they’ve never met you before when you had an in-depth conversation about widgets last time you met. If you’re an introvert, by the way, this can make business encounters and networking even more exhausting than they already are! I’m going to share some coping strategies that I’ve used in my business life (or should have used sooner). If you have this issue, too, I would LOVE you to share your experiences and coping strategies in the comments below! Networking events often feature badges and usually feature business cards. Hooray! You can at least make a note of people’s names and check their badges next time. I am good at recognising words and so I’ll commonly collect business cards from people I’ve met, then look out for those names next time. If you can’t read the badge from a distance, make a conversation about it: “Oops, my badge is peeling off,” “Where did you get your name badge from?” (this one only works at the beginning, obviously). Moving around the event and re-meeting people, a quick glance at the badge will reassure you as to whether you’ve met them before. If you’re at a one-day conference or training day, people aren’t likely to change too much. If you know you’re not good with faces, concentrate on earrings, unusual shoes, an e-watch – any clue that you can pick up that will help you to match the person to someone you know when they come around again (you probably already do this, but just in case). Weirdly, having a role that means lots of people talk to you can make it easier. They probably won’t expect you to recognise them, so if someone’s chasing up their gluten-free lunch, they’re likely to say so, meaning you can context-match and have the appropriate conversation. If you’re already in the meeting place, perhaps sitting down in an open and friendly position but looking at your phone or gazing calmly around you, it’s much more likely that the other person will come to you. If a different person you know, nothing to do with the meeting, just happens to come in, you’re just going to have to hope they have very different attributes (different gender, age, etc.) to the person you’re meeting – but I’ve never had a mix-up. This one works for dates and meeting up with a new friend, too. If you can manage to be super-friendly and approachable with a “Hi, how are you?” you can often pick up hints as to whether the other person already knows you from their answer. If you know you’re going to be doing a regular event, volunteering session etc. there’s no shame in enlisting the help of a friend. I try to take my husband when I’m meeting people at the railway station (so many faces!) and pal up with a known person who can give me clues and cues when I can. My job, as I mentioned above, doesn’t involve me being face to face with clients. I really do not know how I’d do that, actually. If you do have that kind of role and this condition, I really would like to know how you manage, as it will help other people (pop a comment below or get in touch if you’d rather be anonymous). You can use the tips above to work out who people are, and if you have regular customers, you will start to recognise them in time. How do waiters and teachers manage it, I wonder? If you meet one of us and you know (because we’ve told you) or suspect that we are prosopagnosic, please bear with us! We do not mean to be rude! Of course, I’m better at recognising (ha ha) this in other people, and I have managed to reassure and inform a couple of people that it’s not them, it is A Thing, but if someone fails to recognise you a few times, reintroduces themselves to you when you think they know who you are, or has to ask your name when they’re ticking you off a list and they’ve met you a few times before, chances are they’ll have a touch of prosopagnosia. Do introduce yourself, just “Hi, it’s Liz the slow runner, we met at the back of the pack at last week’s run” will work wonders. Don’t think they’re stupid, it’s just one aspect of them. We all have blind spots. I’m really good at recognising voices, for example. Don’t suddenly grow a beard or dye your hair without warning them (that’s a bit of a joke of course, but if you’re close to a prosopagnosic, it’s best to warn them of any major changes in appearance coming up, and remind them afterwards). If they ask you who someone is, or to help them spot their husband in a crowd – again – don’t sigh with exasperation, just try to help. 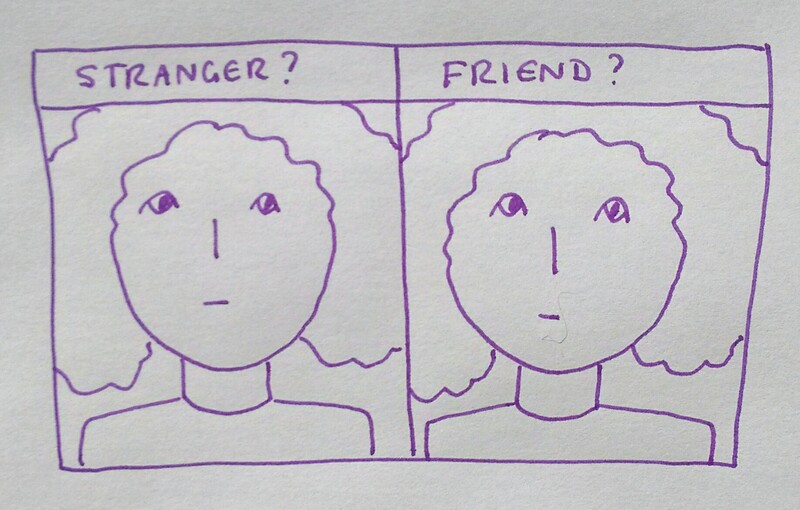 I hope this has helped anyone with prosopagnosia feel less alone. If you want to get in touch with me about it, feel free to do so via my contact form. The Guardian article explains things very clearly and easily, with good examples. If you think you have prosopagnosia, the Cambridge Face Recognition Test (CFRT) is the one to take. The prosopagnosia website is a bit more formal but ever so useful, and there’s a discussion forum, too! And as I said, if you have anything to add or any help you can give or stories to share, please comment below. And if you know anyone this article might help, please share it using the sharing buttons below. Thank you! PS: This was quite a difficult article and image that I wanted to get right. Thank you to the people who helped me out! That’s a very interesting article. I’ve never heard of that condition, but it’s very useful to know that it exists so I can be mindful of it in people. Very good advice to explain it to people as well. I once met a man at a networking event who told me he had Asperger’s Syndrome and what that meant in terms of the event. I was glad he’d explained. He said that one person had already walked off when he was talking to them! Probably why he felt the need to explain. I’d heard of the condition, in relation to people who had the most severe form of it, but didn’t realise that there were degrees of prosopagnosia, so thanks for explaining more about it. This is informative on an interesting topic. I made a note to take that Cambridge test you mention. Thanks for this write-up. I aced the Cambridge test yet I definitely have a mild form of the condition, and it affects both my business and social life. I could bore you for hours by telling stories of situations which have been very embarrassing, because I thought someone was a stranger even though I actually knew them quite well. I’m sure i have a reputation of being a snob, or a bit weird! ** Remember hair style and color, body shape (e.g. weight), age, and gender. Those factors alone will help identify (probably) 80% of the people I know. Voice and posture also help. ** Study and remember distinguishing features. Facial hair, a mole, a big nose, bushy eyebrows (like one of the characters in the Cambridge test), a big chin, etc. ** When someone I don’t recognize starts talking to me I always act as friendly, as if I know them. I usually hope to figure out who I’m talking to within 1 or 2 sentences of conversation. ** Look as if I’m concentrating on something other than the person I’m passing in the street, in the office hallways, or at the airport … and let them recognize me first. Their voice might help me to ID them quickly. Thank you so much for sharing your tips – I agree with all of them. I like the one about pretending to concentrate on something else – I use that when waiting for people, too, deep in my book so they have to come up to me, having (presumably) recognised me first. Not sure what would happen if I was meeting a fellow prosopagnosic, of course! Thank you for this article! I honestly can say that I completely recognize every single experience, tip and strategy you describe! Right down to the husband-facial-hair-change! I try to be honest with people too, especially when I meet someone I’d like to talk to again in the future. Your article was reassuring to me – I’m not alone here! You’re welcome – glad I could help in reassuring you. There are a couple of Facebook groups that are very supportive. You don’t mention memory in your blog (I think), it’s all about recognition. I always say I’ve a terrible memory for faces – which I have, although now I see I may have a mild form of prosopagnosia. But surely recalling someone’s face is the key issue. Or is that what you mean by ‘recognise’? ie. note the distinctive features and compare them with faces stored in your memory to come up with a name. But that raises another issue. I’m also hopeless at remembering new people’s names, so even if I ‘recognise’ them (probably through meeting them again in a similar situation) I usually can’t remember their name. Is remembering faces – as opposed to recognising them – and remembering the right name to go with the face, a different issue? The point I’m trying to make is that I don’t even recognise the person as someone I’ve ever seen before, they have no familiarity to me whatsoever – not like seeing someone thinking, “Oh, I know that face, but where from and what’s their name?” but just blank lack of recognition. You could also call that not remembering or recalling having seen them before. But I will remember the person if I hear their voice (if it’s fairly distinctive) or they are wearing the same clothes as last time, and I remember almost everything someone tells me about themselves, so I tend to say I don’t recognise them. Does that make sense / help? Yes, I see the distinction you are making, although the process of recognition is twofold. First there needs to be an identification of visual features and second, a matching of those features to others stored in our memory. I wonder is face-blindness a bit like dyslexia where what we ‘see’ is not what is actually in front of us, and so unfamiliar to us. Or is the disfunction in the link where we should be able to compare what we see with our memory banks? If that link doesn’t work then the face will appear to be unfamiliar. But perhaps this is too simplistic. Why should the link only malfunction for faces and not shoes or voices. I’m sorry, I was just talking about my own experience and not casting myself as an expert, and you might be better off exploring the links I provide in this article as I can’t answer that. It does typically only work for faces, and does with me, although some people are bad with directions, too. Don’t worry. I was just thinking out loud, as it were. Thanks for your blog, Liz.